Although this is my second year in the US, I’d never actually been to a traditional American Thanksgiving dinner. Glutton that I am, I made up for it this year by attending two dinners. One of my friends celebrated Thanksgiving on Friday, so on both days I got to revel in unreasonable amounts of food. They were both really fantastic: the first was with a friend’s family, and it was very cozy and traditional; the second was a lovely and relaxed evening with friends. Both events also featured an alarmingly huge turkey, which I gather is the main point. 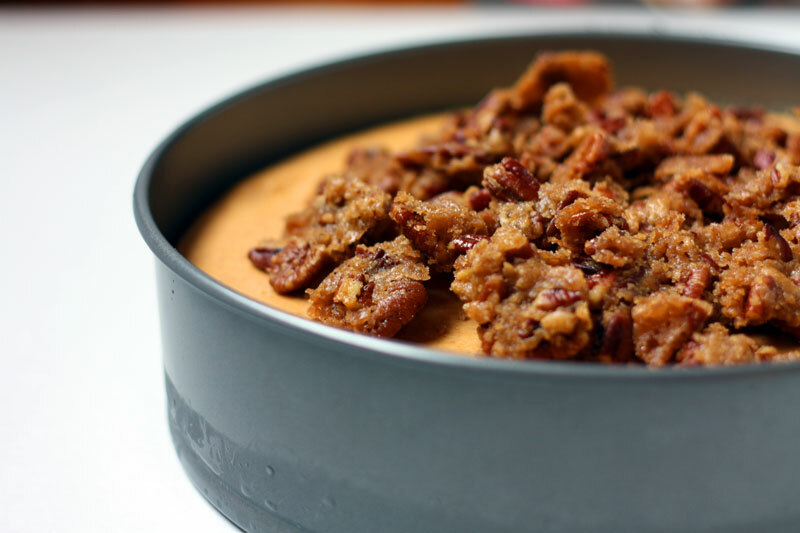 Thanksgiving seemed like the perfect opportunity to try out the pumpkin cheesecake recipe I recently found, but two dinners presented an even better possibility: to compare two separate recipes. Of course, this also meant separately making and baking two cheesecakes, and yes I was up until three in the morning getting it all done – but it was so very much worth it. The two recipes were the Pure Pumpkin Cheesecake from Rose Beranbaum’s cookbook, and the Spiced Pumpkin Cheesecake from Bon Appétit. Which was better? Um, I’m going with the cop-out answer: they were both really delicious, and quite different from each other. What they had in common was that they were surprisingly light for cheesecake, which was good given that they came at the end of an incredibly heavy meal. In fact, one friend who announced that he was too full for dessert somehow managed to eat three pieces (I might also have accomplished this feat. Two nights in a row.) Another friend announced that it made his cheeks tingle – I chose to take that as a compliment. Rose’s cheesecake was incredibly creamy and smooth, and the pumpkin flavour came through really clearly. The caramel topping was also amazing, and it was worth the fact that I burned it to my pot on the first try (caramel is scary). The crust was a bit of a disappointment though, as it was pretty mushy. Next time I would try prebaking it for 10 minutes or so, to get it a little crispier. The BA cheesecake was also fantastic: it has twice as much cream cheese, so the filling was much tangier. The spices and cream cheese were a great complement to the pumpkin, which was much more subtle in this rendition. The filling was more reminiscent of pumpkin pie, and was sturdier than Rose’s version, although still light and creamy. I topped it with a pecan praline, but the sugariness was a bit over the top, so next time I’d stick with a caramel drizzle. The verdict? They’re both great, and you should pick the filling based on your own tastes (creamy and pumpkiny vs tangy and spiced). With either crust I would make sure to prebake it, and the caramel topping would be great with both. Also, be warned that if you eat three pieces you might feel somewhat ill afterwards. This recipe turned out great, but there were several disasters along the way. I blithely ignored the fact that you needed a food processor for this recipe, and tried to do it with my hand mixer. That did not work out. I managed to solve it by using my immersion blender instead, but note that this recipe really needs a serious blade to come out right. I also found the cheesecake needed a longer bake time than she specified (what’s listed here is what I used), so gauge according to your own oven’s behaviour. Preheat oven to 350°F. Wrap a 9-inch springform pan in tin foil to prevent water leakage. For crust: Toast pecans until browned and aromatic, about 7 minutes. Put in food processor along with gingersnap crumbs, sugar, and salt, and process until fine crumbs, about 20 seconds. Add melted butter and pulse just until incorporated. Press crumbs into bottom of pan and 1 1/2 inches up sides (it helps to use a measuring cup). Although the recipe didn’t specify this, at this point I would prebake the crust for about 8-10 minutes, until golden. 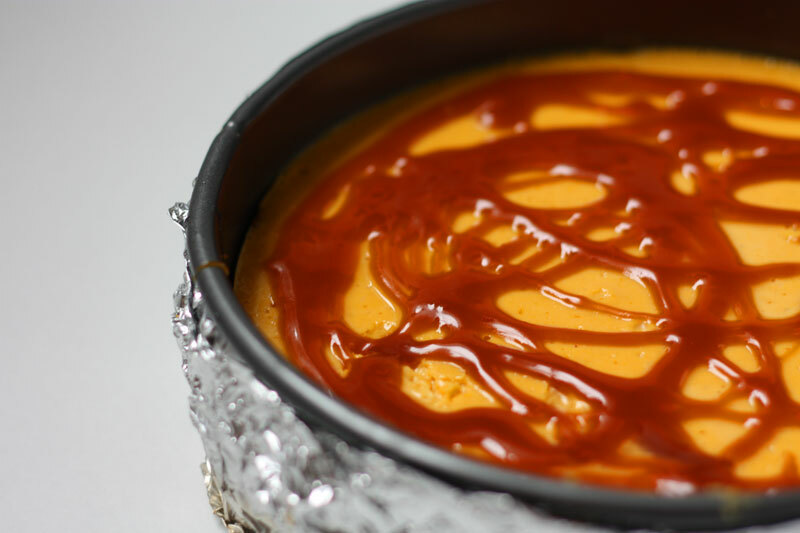 For filling: Stir together pumpkin and sugar in small pot, and stir constantly on medium heat until sputtering. Reduce heat to low and cook until thick and shiny, about 3 to 5 minutes. Scrape into food processor and process for 1 minute. Add heavy cream with motor running. Add cream cheese and process until smooth, about 30 seconds. Add eggs and yolks and process until just incorporated. Scrape filling into crust. Put springform pan in larger roasting pan and fill with 1 inch of hot water. Bake for 55 minutes, then turn off oven without opening and let the cake cool until middle is softly set, about 1 hour. Cool on wire rack, then chill overnight in refrigerator. One tip: be super, super attentive. I would ignore all instructions about temperatures, because while you’re fiddling with the thermometer your caramel has already burnt. This I know from experience. In medium pot, preferably nonstick, stir together sugar, corn syrup, and water. Stir constantly over medium heat until sugar dissolves and syrup is bubbling. Stop stirring completely and let moisture boil until deep amber, lowering the heat when it starts to change colour. Remove from heat and carefully pour in cream. Scrape up solid bits and return to low heat, stirring gently for 1 minute. Remove from heat and stir in butter. Pour into a glass measuring cup and let cool slightly. Mix in vanilla and let cool to room temperature. Scoop into piping bag and swirl all over cheesecake. Preheat oven to 350°F. 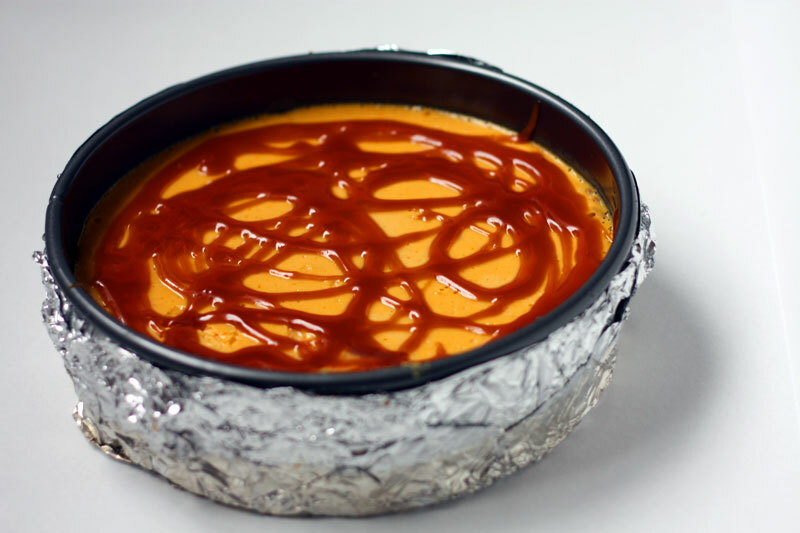 Wrap double layer of heavy-duty foil around outside of 10-inch-diameter springform pan. Combine graham crackers, sugar, and cinnamon in processor. Blend until graham crackers are very finely ground. Drizzle butter over. Pulse until crumbs begin to stick together. Press crumbs onto bottom (not sides) of springform pan. Bake until crust is slightly golden, about 10 minutes. Transfer to rack and cool while preparing filling. Maintain oven temperature. Using electric mixer, beat cream cheese and sugar in large bowl until smooth and fluffy. Beat in eggs 1 at a time. Add pumpkin and remaining 7 ingredients. Beat just until blended. Pour filling into prepared crust. Place springform pan in large roasting pan. Add enough water to come halfway up sides of springform pan. Bake cheesecake until slightly puffed and softly set and top is golden, about 1 1/2 hours. Transfer springform pan to rack and cool. Cover and refrigerate cake overnight. Using knife, cut around sides of pan to loosen cake. Release pan sides. Sprinkle praline over, leaving 1-inch plain border at edge. Cut cheesecake into wedges and serve. I love the fact that you took the time to compare/ contrast recipes…it is so helpful!!! 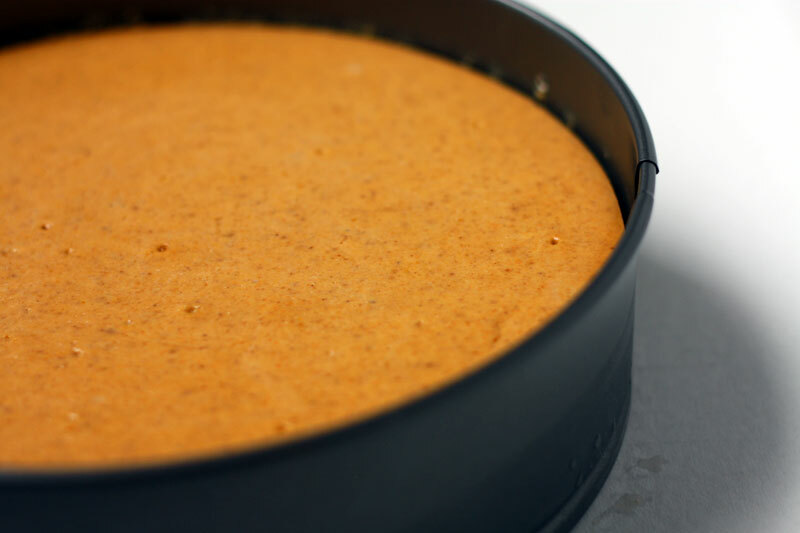 I searched online for a pumpkin cheesecake and after many hours of looking and reading, I decided to try Rose’s recipe. However, while in the process of making, I decided to add spices, which were not listed on her recipe. I love spices so this was one of those opportunities where I had to use some! I added a bit of fresh grated ginger, nutmeg, cinnamon to the mixture. I didn’t have any clove on hand. I also added a bit of caramel sauce to the mixture which at the end, I really enjoyed it. For the crust I didn’t have time to get the ginger snap cookies so I did the graham cracker crust w/o adding the sugar to it. I figured the cheesecake is rich enough that I can omit the sugar added to the crust, for my liking! I really like Rose’s recipe and like you said, it did produce a very creamy, and smooth cheesecake! I adore everything pumpkin. Thanks for the tips about the food processor and baking time. I’ve been eying this recipe in her book for a while. You are currently reading two thanksgivings at one cake two cake.